Mike is working a twelve hour shift today, and on days that he's not home for supper I cook things that he doesn't like. Although why he doesn't like this is beyond me. I'm not actually sure how it's considered a main course rather than a decadent dessert. The first time I had this was at a baby shower brunch and it was served with a fresh fruit salad and a platter of sliced cheese and smoked stuffed tenderloin from Premium Sausage in Seven Persons. I highly recommend those side dishes or something similar to balance out this achingly sweet main dish. Cook the brown sugar, butter and corn syrup until combined, stirring often. Pour syrup into a 9x13 pan. 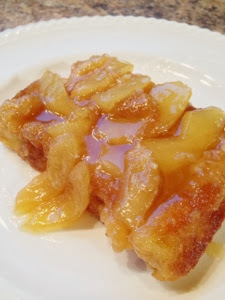 Place slices of apple over the syrup. Place bread over the top of this, you may need to squish them in as you want a single layer. Whisk together eggs, milk and vanilla and pour over bread, distributing evenly. Bake uncovered for 40 minutes at 350°. Flip over just before serving.